ManikchandPahade Law College, Aurangabad is the oldest law college in Marathwada region. On the eve of the states re-organization prominent Advocates and educationist of Aurangabad took the lead to establishing “Marathwada Legal & General Education Society”. Prominent amongst them were Mr. Govindbhai Shroff, Late H.G. Vaishnav, Adv. L. S. Kulkarni. The society was established with the mission to establish the law college in the region, as at that time the facility for higher education in general & legal education in particular was lacking. For taking legal education students had to run to places like Hyderabad, Nagpur, Pune and Mumbai etc. Next task for the society was to raise funds and to establish infrastructure for the college. This task was shared by the “ManikchandPahade Smarak Samiti”. The college is posthumously named by ManikchandPahade, the great freedom fighter who has contributed a lot in freedom movement and in “Hyderabad Mukti Sangram”. The College was established with the following goals. a. To make legal education socially relevant. b. To forge new tools and innovations so as to make, legal education more and more clinically oriented. c. To make constant efforts to alter pedagogy. d. To keep in pace with the reforms in legal education. Well qualified teachers and leading advocates as faculty taking interest in rendering their services and expertise to the students is the unique feature of this college. This is the only college in this region having 12 full time faculties with NET / SET qualifications. Eight of them have completed Ph.D., one submitted and others are perusing the degree. Moving from theoretical education towards clinical education, college organizes National Level Moot court Competition since last 18 years. This is the only institution organizing National Level PowerPoint Competition on socio legal issues. Last year and this year college received good response for this competition and 15 participants in final round presented their techno legal skills on the contemporary socio legal issues chosen by them. In order to make legal education socially relevant to provide legal aid to poor and needy, college runs free Legal Aid Clinic and also organizes legal aid and awareness camps. Awareness is created through street plays and poster exhibitions. 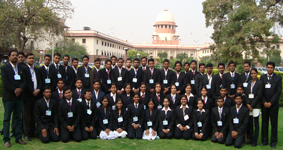 In 2006-07, college was accredited by National Legal Service Authority, New Delhi for creating awareness through organizing legal aid camps. the college has received funding from NALSA, New Delhi to conduct Legal aid and awareness camps in rural areas with in the vicinity of Aurangabad District. The college as a part of LL.B. & LL.M. curriculum conducted survey on local contemporary issues of public interest. The college has two N.S.S. units sanctioned by the university. Which are doing tremendous job through organizing activities like blood donations, tree plantations, health check-up, personality development etc. are conducted by this unit. The N.S.S. unit of our college adopted the village Pimprirajaof Tq. Gangapur Dist. Aurangabad for a period of three years. Every year the College is organizing NSS camp for period of Ten Days in which we will take up Awareness, Sanitation, Tree Plantation, De-addiction, literacy, etc. with help of the villagers and concerned authorities. The NSS unit of the college has been awarded for the extension activities by various authorities and NGOs. It is a part of Unnatbharat Abhiyan movement initiated by the government of India for the year 2018’19. Samvidhan Sandesh Rally and Constitutional awareness programme are the unique programmes undertaken by this institute. The object of this activity is to spread awareness and to include Constitutional values amongst students and the public at large. The message about the preamble and philosophy of the constitution is given in English, Hindi, Marathi and Urdu language. Another innovative practice of the institution is Research club through which research interest and skills amongst students are enhanced. The college has fully automated librarywith reference books, text books, law reports and journals both national and international it also consist of e – books and e journals. There is separate facility of hostels for girls and boys. In order to attain academic excellence and to encourage the students and the teachers, to deliberate on current topics of law the College initiated several other activities, seminars, conferences etc. This reveals that M.P.Law College teaches the students beyond books in the practical areas. The College has constant meritorious record. Every year at least 6-7 students of this college are in merit list. Hon’ble J. Shri Sudhakar Rao Kurudukar, Former Judge of Supreme Court of India, J. Shri Arvind Savant, Former Chief Justice of Kerala High Court, Hon’ble J. Afzalpurkar, Hon’ble J. S. V. Gangapurwala present High Court Judge, Bombay High court, J. Kingaonkar V. R. retired High Court Judge, Bombay High Court, Shri J.M. Waghmare former Member of Rajyasabha, are some of the prominent persons who are alumni of this college. Shri Shivraj Chakurkar, former Governor of Rajasthan and Shri Nakade FormerVice Chancellor of Dr. Babasaheb Ambedkar Marathwada University, Aurangabad, is the prominent personalities who were associated with the college as Part Time Teachers. College provides facilities by way of scholarships to SC/ST students, special concession are given to economically backward students. They also get book bank facility from the library. Meritorious students are rewarded with endowment prizes. Admissions in the institution are given through CET conducted by Maharashtra state on merit basis. While admitting students for different courses norms of reservation are followed meticulously. In order to make atmosphere free from all vice’s college has established Internal complaints committee for prevention prohibition of sexual harassment at work places and Anti Ragging Committee. The objective f both the cells is to promote and to protect human rights. The Anti-ragging committee and the Anti-ragging squad the UGC Regulations under the guidance of Principal are constituted and the structures of these committees at our college are as follow. Anti-Ragging Mission boards containing warning for prohibition of ragging, punishment for ragging, helpline/mobile numbers of functionaries at college and toll free helpline number are displayed at different places in college campus. The college has grievance redressal committee for students. The students are the most important stake holders of any institution. Therefore, while planning co-curricular activities, the student representatives are considered. Governing council of the college plays very important role in developing the institution. Most of the Governing Council members are reputed legal practitioners so the inputs given by them are professional and are very useful for the progress of the institution. In order to develop global competencies self-financed five diploma courses and for students of the institution certificate, add on and value added courses are started by the college. Thus the institution is one of the most premier and pioneering institution imparting legal educations and is catering best learning facilities. Particularly, we have focused on rural pockets of Marahtwada to spread legal education. 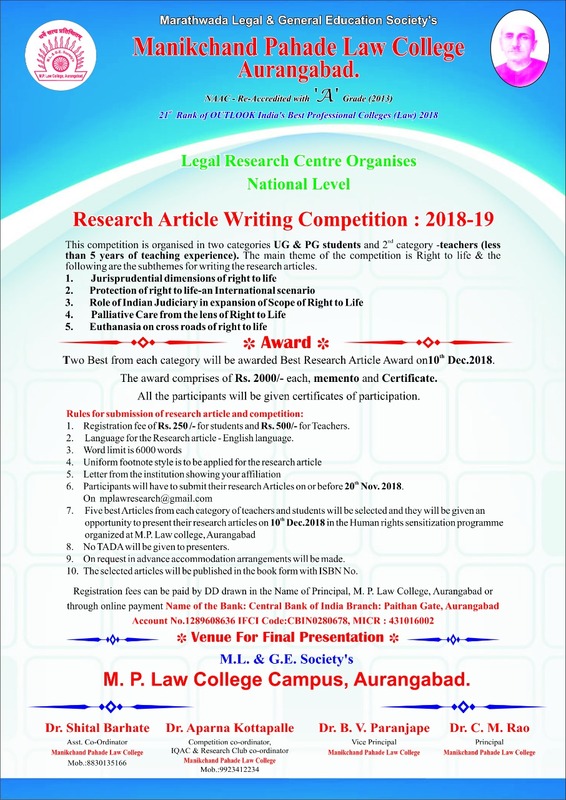 As stated in goals and missions of the college, the aim of the college is to impart qualitative, clinically oriented, empirical and socially relevant legal education. The college emphasizes on inculcation of strict discipline, punctuality regularity among the students and the staff. Our forward looking vision is clearly reflected in continuous and constant efforts to update ourselves with contemporary developments. This year the college has organized National Seminar on present challenges to Indian Democracy funded by ICSSR, New Delhi. The college has one Major research Project on “Working of Consumer Forums in Maharashtra pendency disposal of complaints and remedial measures” to its credit along with 5 publications with ISBN. Another Minor research project on “PIL” is in progress. The College has also applied for re-accreditation by NAAC for third cycle and is undergoing the process of preparation of the peer team visit. The college have student and teacher exchange programme under MoU with National Law School of India University, Bengaluru. College has MOU with local institutions for ground and physical facilities for sports which is found to be of immense importance. In future college plans to apply for certification for ISO. The College has completed sixty twoyears of its establishment and we look forward to have unique status with Centre for Potential Excellence in nearby future.